In addition to playing big games of SAGA, I have been busy beavering away at painting more Romans. These bases will represent my FL Auxiliary units in Impetvs, and are looking pretty nice I think! Miniatures are Warlord Games plastics, with the shield decals from the same kit. The shield decals are... fiddly to say the least. I am happy with how they turned out, but they do seem excessively fiddly for a pretty alright result. Next up, we have a unit of FP Gladiators! The miniatures come from Crusader, and represent some of the heavily equipped Gladiators, the Murmillo. Known for their massive helmets, these guys were a sort of gladiatorial representation of Legionaries. Armed with a gladius and shield, they would often be pitted against lightly equipped gladiators such as the Retiarius, to provide the greatest sport. 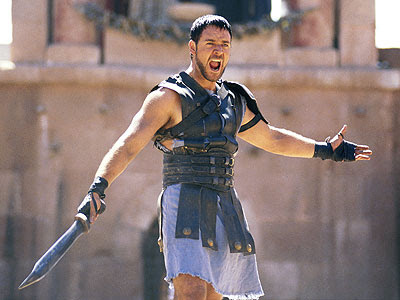 And of course, what unit of Gladiators is complete without this guy? When I saw that Crusader had a miniature of him, I just had to get him, too cool not to! So my army now has 1 Maximus! Another 66 points painted for Impetvs. Next up, talk of Southcon and more Romans. They are seriously nice figures and well painted!!! I hope you guys are going to roll out some Impetvs or Dark Saga for a demo at Southcon. Would love to see it played up close. Well done, Chris! They all look great. The shield transfers really finish them nicely. Seriously cool stands mate. Paint job, minis, basing etc.